I would highly recommend to everyone – even people on land to take a marine medic course. I did the Marine Medic course last year – there are two to choose from – Coastal and Offshore. If you are an adventurous person and are regularly away from immediate assistance then this course is highly valuable. Going further than your normal first aid, this course assumes you could be days away from help. I have just this week done a normal first aid course through work. They basically taught us how to dial for an ambulance – a bit of CPR, perhaps a bandage, and that is about it! The Marine Medic course goes much further – as lets face it, you could be at least hours, possibly days away from help. There is no ambulance coming – now what are you going to do!? First of all, you are going to need a decent first aid kit. Oceania Medical produce brilliant kits for boats, or for anyone who needs to be a bit more self sufficient. I hope I never have to use any of it! But I feel like the course gave me the confidence to be able to handle a medical situation much better. 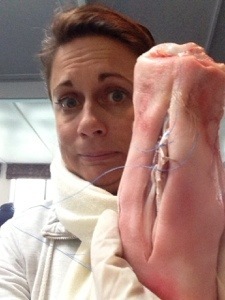 The photo by the way is my effort at stitching up a pigs trotter… You had better hope you don’t get cut near me! !